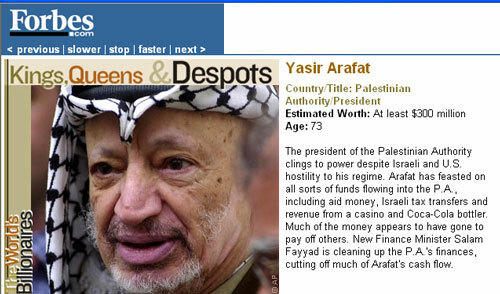 Arab Despots star in Forbes Report 2003 "The World's Richest People"
Arafat's Swiss Bank Account (exile-based Issam Abu Issa, former chairman of the Palestine International Bank and founder of the Palestinian National Coalition for Democracy and Independence, The Middle East Quarterly, Fall 2004): "Yasir Arafat and the Palestinian Authority are known internationally for the violence between Israelis and Palestinians. As ruinous as that violence has been, another cancer permeates Arafat's administration; its name is corruption. From firsthand experience, I understand just how deep it is." End sleaze or lose aid, Arafat told (Ross Dunn, The Scotsman, Feb 29, 2004):"The World Bank has issued the Palestinian Authority with an ultimatum to put an end to rampant corruption or lose hundreds of millions of pounds of vital foreign aid. The Bank’s top official in the region, Nigel Roberts, said Yasser Arafat had to stop the handing of large cash payments to his security commanders - used to keep them loyal to Arafat personally - and other financial practices open to corruption. Otherwise, he said, the Palestinian Authority risked losing the support of the international community. In an interview with Scotland on Sunday, Roberts said the Palestinians were receiving the largest amount of money per capita in the history of foreign aid but this was still not enough to balance the budget." 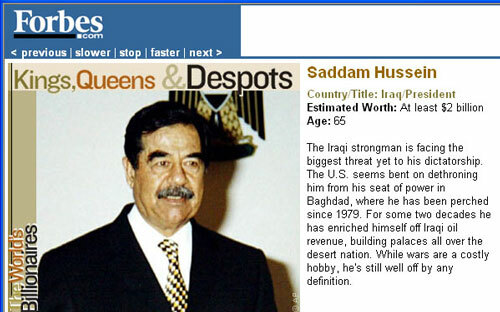 The Saudi War on George Bush (Ed Lasky, The American Thinker, March 10th, 2004: "The largesse of the Saudi royal family is legendary. 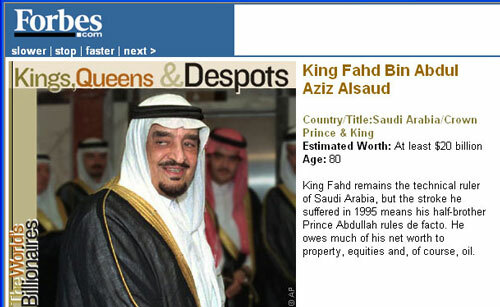 The Saudi Ambassador to the United States, Prince Bander bin Sultan, has boasted of his success in cultivating powerful Americans: If the reputation then builds that the Saudis take care of friends when they leave office, you would be surprised how much better friends you have who are just coming into office.The list of ex-office holders who propagate pro-Saudi spin is a long and disgraceful one."